The Chinese domestic app market is notoriously difficult to succeed in for independent app developers. The Chinese app market is gigantic with smartphones expected to reach 47% penetration of the population by 2016. But without the backing of larger companies such as Tencent, IGG and Chukong, local indie mobile game developers often struggle to acquire players in China. In order to thrive, many Chinese games developers are turning to international markets with a different ecosystem. 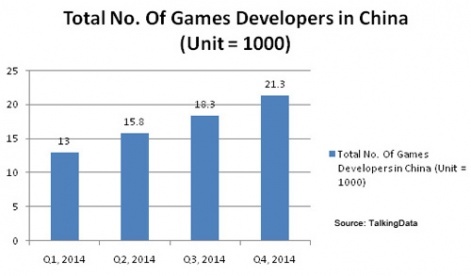 Overseas game revenues for Chinese-based developers increased 366% in 2014. At the same time, the Chinese indie game developer environment is blossoming. In China in 2014 the amount of games developers increased 83% over the year, from 11,600 in January to 21,300 in November. China saw almost 17,000 mobile games produced, and that number is expected to rise in 2015. Getting users for games in China, however, is not so easy. There is a lot of competition between app stores in China so it is difficult to direct players to a consistent download source. Google is all but banned in China, and app downloads come through major app stores such as Baidu, Tencent and 360. For Chinese developers the overseas market is very attractive. International markets can offer Chinese developers more variety. Chinese developers can choose to target high-quality paying users in US, UK, France and Germany (which according to data from the YeahMobi Native Ads Platform can generate 6x higher eCPMs on average than most other countries. Alternatively, Chinese developers can target regions known for high conversion rates such as Brazil, Russia, India and other Southeast Asian countries. The volume and the variety of paying habits of users make all these regions appealing to developers. So how does an indie developer, especially a Chinese indie developer, boost business by promoting internationally? App marketing companies are playing a large role in user acquisition. And now, marketing companies like YeahMobi offer simultaneous monetization and user acquisition. There are programs out there to help developers of all sizes expand their user base and boost direct monetization. 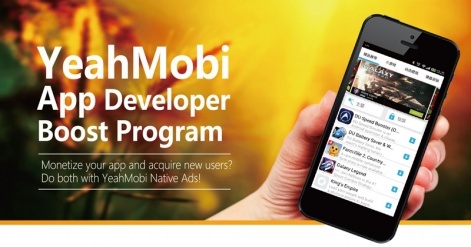 At ad:tech New Delhi, YeahMobi announced its App Developer Boost Program. The program can offer qualifying app developers more user and gamer installs as they monetize, without charging advertising costs. The more their apps monetize the more users they acquire. Getting that extra help with user acquisition while you are developing revenue could be a huge benefit to start-up app developers, especially Chinese mobile games developer companies. These types of program aim to disrupt the mobile marketing industry by changing the dynamic. Instead of first investing in user acquisition at great cost and then working hard to optimize ways an app can bring in big business, app developers can ensure they gain users and grow revenue simultaneously. This dynamic of helping businesses with two of their major aims is possible because of better ad integration and formatting. Developments in ad technology platforms mean that platforms can cater to both the advertising and the monetization needs of app developers. Improved ad formats also mean a better experience for end users. App and games developers can focus more on adapting to their user's tastes and developing their products to offer a better UX. Developers can get more control over integrating ads. Instead of offering banner ads that conform more to ad network designs and standards, developers can ensure that ad content fits the overall format of their own apps and games. As mobile ad technology develops in 2015, the industry is seeing better quality ad displays in the form of mobile native advertising. Mobile native ad platforms can help app developers get better engagement and more downloads from users. At the same time these platforms offer potentially huge revenue in monetization. Programs like YeahMobi's Boost Program offer an excellent opportunity for Chinese app start ups to achieve international success and recognition. YeahMobi's App Developer Boost Program is also open to developers globally looking to boost their business.